I'm glad you're here, and I hope it's because you want to write a queron for the new, illustrated collection I'm working on. If so, I hope you enjoy playing in this poetry form and that you come up with something you like. Queron is a fussy form, about the same level of difficulty as a sonnet or maybe a little more complex. I find that they take time, a slowness in drafting and considerable patience in revision. If you've hammered out at least a few sonnets in your life that you are happy with, then I think you're primed to take this on. Otherwise, prepare for a new experience. In either case, bring all your literary skill and talent with you, and be patient with yourself. Writing querons requires deliberate attention to rhyme, syllable count, content and pacing. Making a mess helps me draft querons. 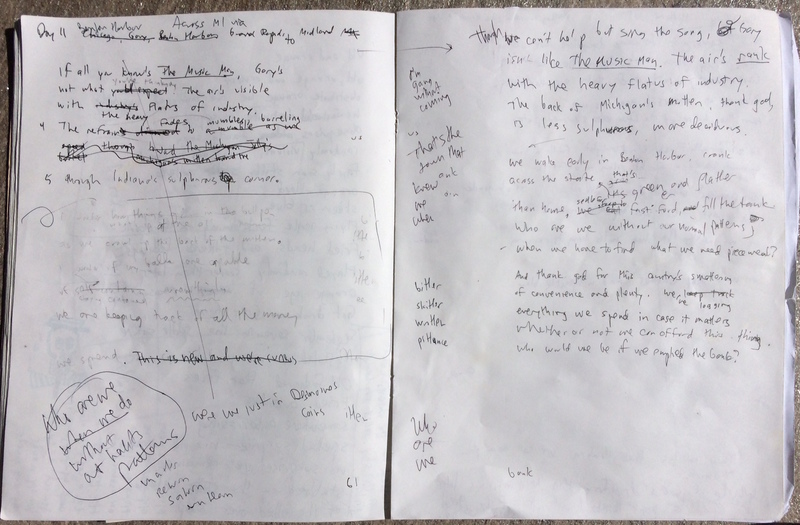 Here you can see changes in the first stanza from pass one (left) to pass two (right), a whole section excised (middle left), a partial rhyme list in the margin (center), a note-to-self about a key theme (bottom left), and a pretty standard amount of strike-thru for my first drafts. Each of these letters represents one line in the 17-line poem; all the a's rhyme, all the b's rhyme, and so on. Because rhymes repeat four or five times each, I’ve found that using slant rhyme works better for me than adhering to true rhyme. Slant gives you more possibilities. Anyway, I think of rhyme more as a scaffolding for me as I write than as an effect I am trying to create for the reader. I like a poem to sound almost conversational—but that's just my approach. Lines have an intentional length. Usually, it's the same number of syllables in each line. A specific number of syllables is not prescribed, and there are other ways to have an "intentional \length." You could count words, accented syllables, or letters, for example. And instead of an equal number of units in each line, you could follow other numerical patterns such as counting up or counting down. But 98% of the querons I've written have the same number of syllables in each line. For my querons, the mode is 10 syllables, and most fall in the range of 8 to 12. I have written querons with as few as one and as many as 26 syllables per line. I don't use meter—iambic pentameter, for example—but one certainly could. Queron have a questioning nature, not one of certainty. They're about awe not aphorism, wonder not wisdom, asking not answering. That said, there's a lot of leeway in terms of what "counts" as questioning, so don't feel constrained. Querons offer the opportunity for changes and shifts in subject or tone as well as small narrative structures. In terms of pacing, each break between the five-line stanzas can usher in a turn—like the turn in a sonnet. So you have two opportunities to pivot. Stanza two could be an "on the other hand" to stanza one," and stanza three could be an "on the OTHER other hand." Another possibility is that, as in a simple short fiction, the first stanza could establish settings and characters, the second could offer rising action to a climax, and the final stanza (plus the last couplet) could wrap up the story. This stanza-to-stanza shifting is suggested—and engineered to work well—but is not a hard rule. My wife fears she’ll accuse us of lying. No. It was right for us to play along. the pieces of the game and meta-game. note for them, telling us not to kibbitz. The experiment’s on. We’ll do nothing. faeries are fake, nor are we false agents. You can see how the plot turns from exposition in stanza one about our family's faerie play, to my daughter's decision to look for truth in stanza two, to her actual experiment in stanza three. The poem does not tell you how the experiment came out, nor do I take a stand against or for the existence of faeries. Having written nearly 500 queron since 2009, I can share some approaches that have helped me and that I sometimes use. 1. WHEN I HAVE SOMETHING TO SAY, I dash it out, almost as a freewrite, aiming at approximately 17 lines and approximately 10 syllables per, but not taking any time to count. Once the idea is completely drafted, I check that the poem has a pacing with a couple of turns in it as well as that questioning nature of the queron. Then I start to revise line by line, laying the ideas into words that fit the form. Often, I will find the natural rhymes in a draft and highlight or circle them with different shapes or colors to see where I may have sets. As I smith the draft into the form, I allow myself to change what it was I was saying, if something more interesting comes up. 2. RHYME LISTS form in the margins of my drafts. Once I know I've got a rhyme with hello and mellow, I'll just list every word I can think of that would fit (sometimes referencing Rhymezone.com). Bellow, below, cello, cellophane, envelope, fellow, nickelodeon ... you get the idea. 3.WHEN I HAVE NOTHING TO SAY, I just start with line one. If it's 11 syllables or 13 or 7, that's fine because I don't need to choose until I need to choose. The second line is easy enough, too, not yet having to rhyme. All I have to do is match the syllable count, or adjust the first line to match the second. After that, I just build line by line and see where the poem goes, letting the process of finding rhymes and counting syllables direct the artwork. It takes time and concentration to weave the rhyme and regulate the pace, and I find that this has often opened up new revelations for me as I explore the unknowing at the heart of the poem. In short, this form offers what I like about poetry forms in general: a way to surprise my own thinking in the process of writing. With a first pass complete in the form, the ideal for me is to let the poem cool for a few days, then to read it with a fresh eye. I look at the whole, I examine each line, and I tinker word by word, seeing what I might improve—while maintaining the integrity of the form. One more thing occurred to me for free-verse poets who might to experiment with this but aren't comfortable with form, and that is to collaborate with me on a poem. Draft something—never mind the form. Then we can get together in person or remotely to craft the material into a queron together. I hope some poets take me up on this idea. I love the enlightening experiment of collaboration. You can read more about querons in my book, One Way To Ask (Norfolk Press, 2016). Get your copy by emailing me at efflux@sonic.net. Let me know that you're going to write and submit a queron for $5 off the $35 cover price, plus free shipping. Once you get the book, you can read about the origins of the form and some experiments I've tried, and look at 80-some examples, all illustrated by a wide range of artists. When you write a queron you'd like to share, email it to me at efflux@sonic.net or post it as a comment below. Thanks for reading. Thanks for trying it. Email me or comment with any questions.